Families are invited to enter our pumpkin decorating contest! 2. 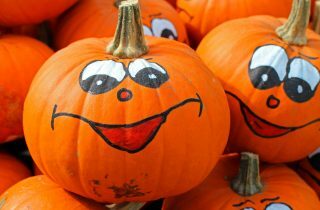 Pumpkins can be decorated in any way using any materials as long as the finished piece is family-friendly. 4. Pumpkins cannot contain any open flame lighting. 5. Electrical outlets will not be available. 6. Entries will be accepted beginning Wednesday, October 17th through Saturday, October 20th at the Central Library. Vote for your favorite pumpkin! I entry per visit to the library. Voting begins Wednesday, October 17th through Monday, October 22nd. Winning family will receive 2 Halloween Books – The Great Pumpkin Charlie Brown Look and Find and In a Dark, Dark Room and other scary Stories in addition to a $25 Dairy Queen Gift Card. For more information, contact the Children’s Department at 330-674-5972, ext. 211.